Mother Daughter Luncheon Bingo Cards to Download, Print and Customize! Print 2 pages of Mother Daughter Luncheon Bingo Cards for free. Download a PDF with 2 free pages of bingo cards plus instructions and a randomized call sheet. Play Mother Daughter Luncheon bingo in a browser or customize the events, free space, etc. 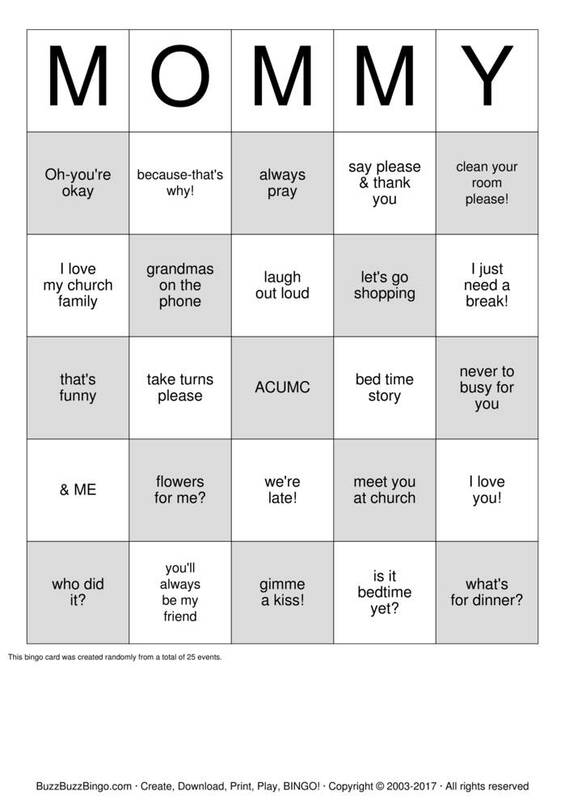 Purchase more randomly generated bingo card pages below. never to busy for you clean your room please! I love you! say please & thank you you'll always be my friend I love my church family what's for dinner? Oh-you're okay because-that's why! flowers for me? that's funny we're late!